Yangon, 14 October 2017 – The ASEAN Coordinating Centre for Humanitarian Assistance on disaster management (the AHA Centre) has dispatched about 80 tonnes of relief items for displaced communities in Rakhine State through Yangon, Myanmar. The items consist of family tents, family kits, personal hygiene kits, kitchen sets, aluminium boats, and generators, among others. The relief items were shipped in two batches, with the first plane arriving yesterday on Friday the 13th October, and the second plane arriving tomorrow on Sunday the 15th October. 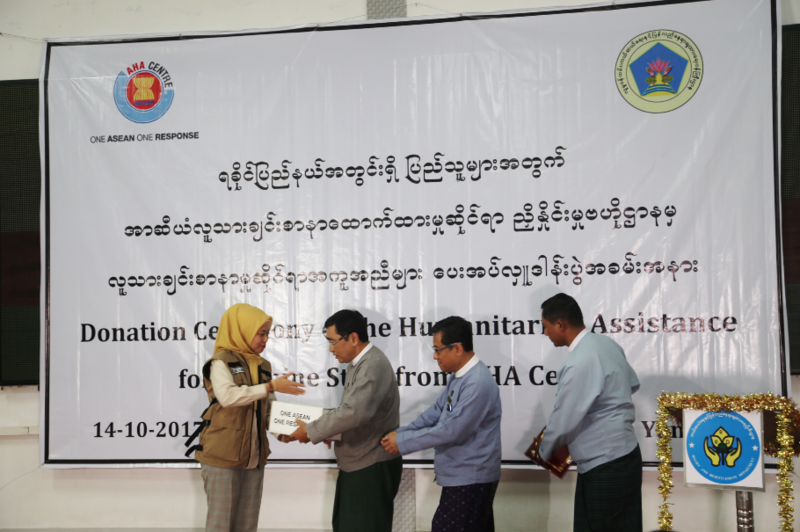 The relief items were officially handed over by the AHA Centre to the Relief and Resettlement Department (RRD) of Ministry of Social Welfare, Relief and Resettlement of Myanmar today in Yangon, to be further distributed to beneficiaries in Rakhine State. 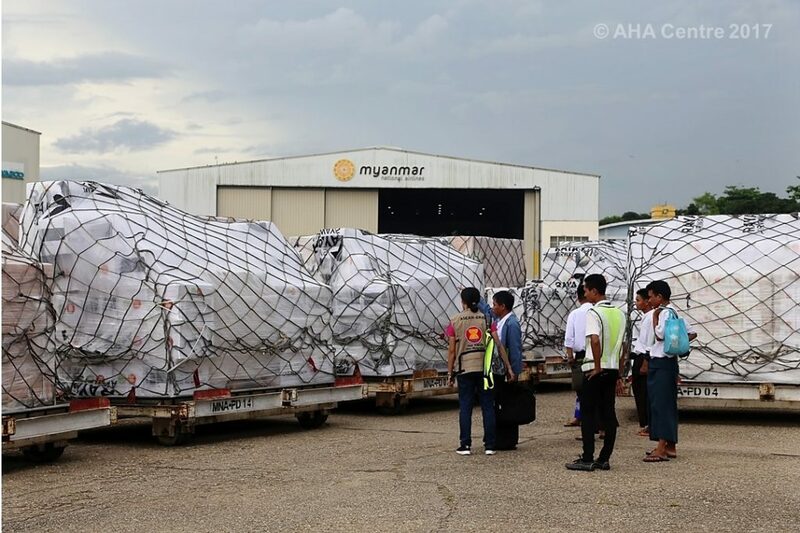 Following the arrival of the second batch of relief items, the AHA Centre will be going to Rakhine State to work closely with RRD Myanmar on the distribution of the relief items to the displaced communities. “We would like to express our appreciation to the Government of Myanmar for the trust and confidence given to the AHA Centre to extend ASEAN’s solidarity to the displaced communities in Rakhine State, under the spirit of One ASEAN One Response. Prior to this, the AHA Centre had delivered ASEAN humanitarian assistance to communities affected by natural disasters, i.e. Thabaitkkyin Earthquake in November 2012, and floods in August 2015. While this time the context of the crisis is different, the spirit that the AHA Centre is delivering is the same. It is the ASEAN’s solidarity. It is the spirit of One ASEAN One Response,” said Ms. Adelina Kamal, Executive Director of the AHA Centre. The handover ceremony was witnessed by Ambassadors of ASEAN Member States to Myanmar as well as representatives from partner countries of ASEAN. The suggestion for the AHA Centre to work with the Myanmar Government-led mechanism to deliver humanitarian assistance to displaced communities in Rakhine State came out during the meeting of the Foreign Ministers of ASEAN held on the sidelines of the 72nd Session of the United Nations General Assembly in New York on 23 September 2017. Based on the Chairman’s Statement, the Foreign Ministers also underscored the importance of increased humanitarian access to the affected areas and that assistance be given to all affected communities without discrimination. The AHA Centre is ready to provide further assistance to address the humanitarian needs of the displaced communities, in coordination with ASEAN Member States. In the span of six years since its establishment in November 2011, the AHA Centre, has responded to 17 disaster emergencies in the region, mostly natural disasters. These include earthquakes in Myanmar (2012) and Indonesia (2013 and 2016); floods in Myanmar (2015), Lao PDR (2013), Malaysia (2015) and Viet Nam (2017); and typhoons in the Philippines (2012 to 2016). In July 2017, the AHA Centre was requested to provide humanitarian support to internally displaced communities from Marawi and surrounding localities in the Philippines. In September 2016, the ASEAN Heads of State/Government signed the Declaration on One ASEAN, One Response, which is a shared vision of enhancing preparedness and increasing the solidarity, speed and scale of ASEAN’s response in the face of disasters. The AHA Centre has been tasked by the ASEAN Leaders to operationalise the One ASEAN One Response Declaration. The AHA Centre is also the operational coordination engine under the ASEAN Agreement on Disaster Management and Emergency Response (AADMER), a legally-binding regional agreement that aims to reduce disaster losses in the region and strengthen ASEAN’s collective response to disasters. The establishment of the AHA Centre in November 2011 was inspired among others by ASEAN’s humanitarian response to Cyclone Nargis in Myanmar in May 2008. 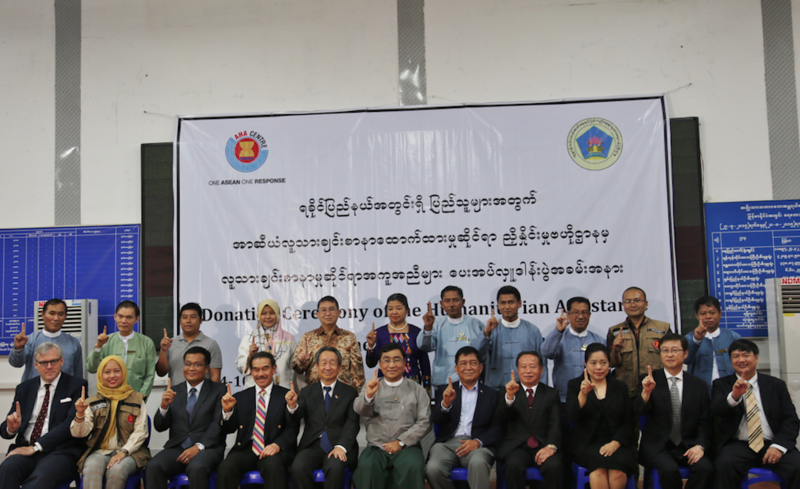 ASEAN established the ASEAN-led coordinating mechanism, and throughout the period of 2008-2010, supported the Myanmar Government-led Tripartite Core Group that successfully facilitated humanitarian assistance to cyclone-affected communities in Ayeyarwady Delta. coordination of disaster management amongst ASEAN Member States. 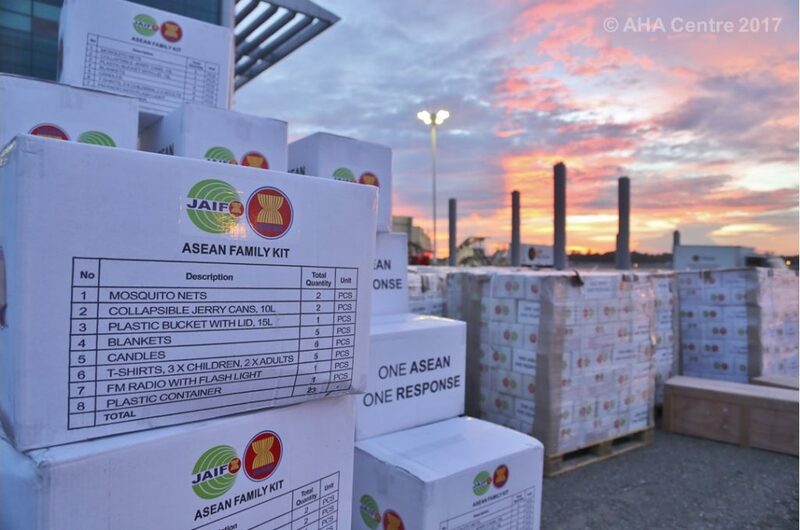 AHA Centre also cooperates with relevant international organisations and partners of ASEAN, including Japan, who has provided support to the AHA Centre in establishing the disaster emergency logistic system for ASEAN and the regional stockpile of relief items. The AHA Centre is based in Jakarta, Indonesia.